One day Fuji Xerox Japan and Seven & I Holdings got together and decided they would make the best service the world has ever seen: Upload documents to a website, then go to any 7-11 in Japan (in Japanese that means "anywhere") and have them printed out at your convenience. The service is called Net Print and I do not know why the companies have not made a bigger deal about this, because it is a miracle for every apartment-dwelling, printerless single adult in the nation (of which there are many). If you've ever needed to print something out while on the road, or needed to meet a deadline when no printer was in sight, or took your USB thumbdrive to work to print out your resume so you could apply for another job, Net Print is for you. To start out, you'll have to make an account at the Net Print website. Click on the big pink button that says ユーザー登録(ゆーざーとうろく). After agreeing with the license terms by clicking 同意する(どういする) and the privacy terms by clicking 承諾します(しょうだくします). On the following page, fill in your name (氏名), kana for your name (ふりがな), telephone number (電話番号), and e-mail address (メールアドレス). 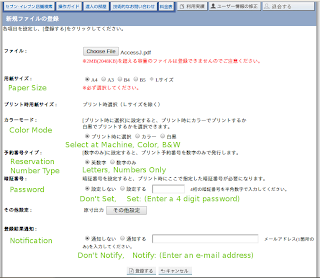 You'll enter the e-mail address again to confirm (確認入力), choose a login ID (ユーザーID). The final two options are a survey (アンケート) and an opportunity to sign up for the Net Print e-mail magazine (メール配信). The survey asks "how you heard about this site" and you must choose one option. The final option, その他, is fine, unless you want to assert that you heard about it from our nameless website with その他インターネットサイト. The default selection on the e-mail magazine is set to not subscribe (希望しない). 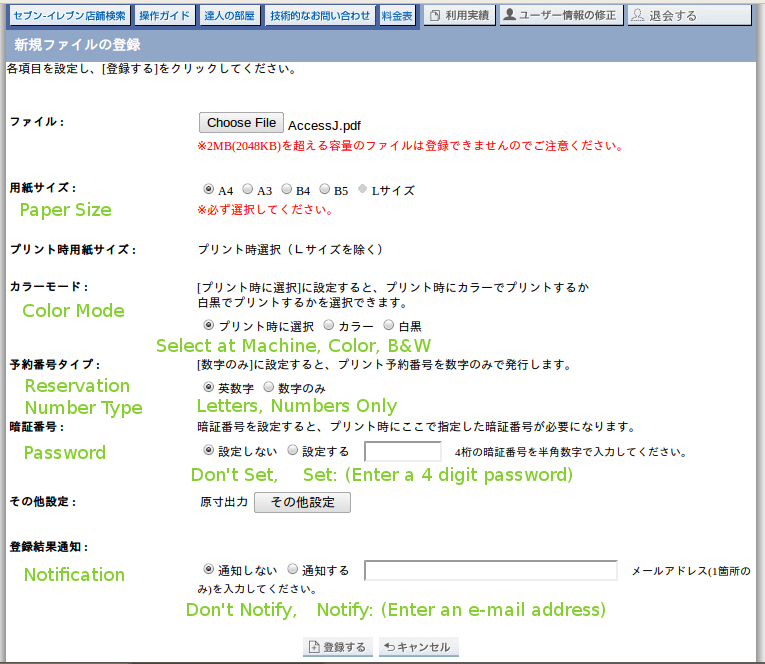 Click the bottom button, 登録する, to complete your application! You should receive an e-mail at the account you used to sign up. Click on the link in the e-mail to activate your account and sign in for the first time. Click on the green button to upload a file. Word (doc, docx, rtf), Excel (xls, xlsx), PowerPoint (ppt, pptx), image files (jpg, png, tif), Microsoft XPS files, and Adobe PDFs. 3) Go to a 7-11 and Print! Uploaded documents will stay on the server for one week. You can print it out at the multicopy machine in any 7-11 in Japan. From the main menu on the copier, select "Net Print" and then type in your reservation number. Black and white prints cost 20 yen (on B5, A4, B4, and A3 size paper), and from 60 to 100 yen per sheet for color prints, depending on paper size.